Hello Heavy Planet readers. My name is Bill Goodman. I run the news/blog over at The Soda Shop which was started by and also run by Jake Ball. Stop by and check it out. Enough of the bs, on to the band. Jake had found these guys and shared the Myspace link with me. It was almost love at first listen. This is truely a very unique band imo. 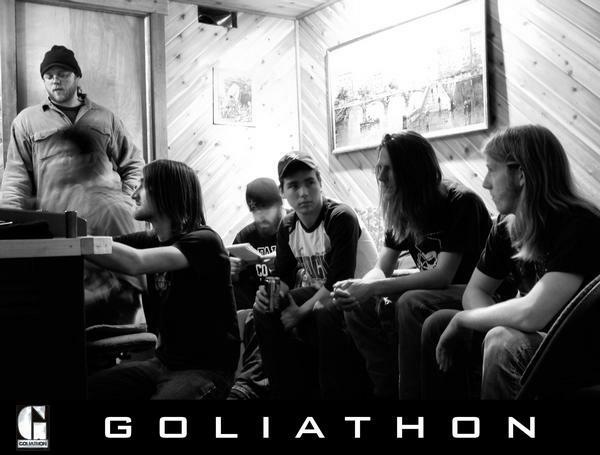 The band is called Goliathon. This band is from Indianapolis, Indiana. Their style is is that of some pretty dirty, nitty gritty southern rock mixed with some garage rock, classic rock and stoner rock. That's a lot of different styles and it's been done before but mix in a little jazz in the right spots and you've got something special. There's some use of a saxophone, an organ and even some harmonica. The track on their Myspace page called "Cocaine BBQ (Part 2) has a distinct wild west feel to it with the harmonica and as the song goes on starts to resemble a rock song with an added piano as a bonus. The demos on their Myspace page are well recorded, so well in fact that they don't even sound like demos. Right now I would have to say that this band's biggest weakness is that they have no music available for purchase. Such a shame because these demos are that good. The good news though, the band is currently hard at work on a debut album which should (hopefully) hit by the end of this year. Log into your Myspace accounts, make these guys your friend and follow their blog. I do believe that once their album drops, everyone is in for one special treat.